Richmond players Matt White and Orren Stephenson were on hand last Friday to present players of the Masala Football Club with their playing guernseys for the 2013 season. The Masala Football Club is a new club, containing players from diverse communities and mainly Indian and sub-continent backgrounds. 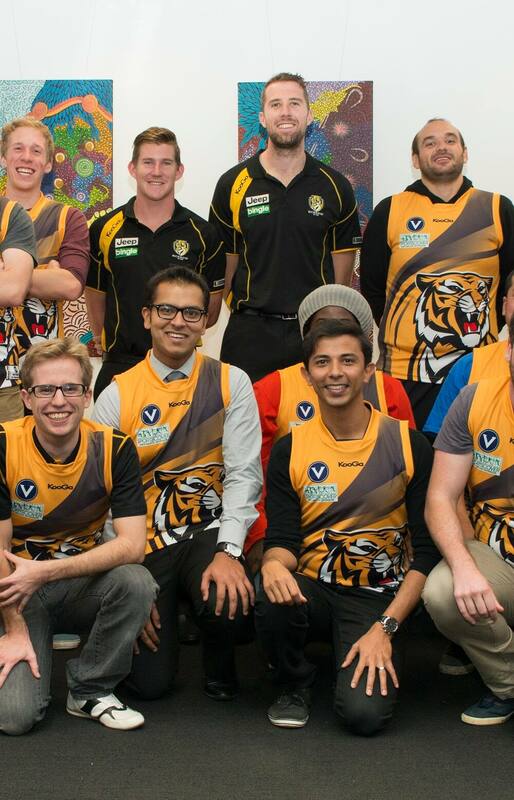 Masala will make its debut this year in the Victorian Amateur Football Association. Richmond proudly supports the Masala Football Club, through the provision of equipment, governance assistance and playing attire. White and Stephenson presented 45 guernseys to the Masala players, and spent time giving them football advice. Masala players and members then walked from the ME Bank Centre to watch the Tigers take on St Kilda at the MCG. This Saturday, the Masala team will play their first-ever game, fittingly at Kevin Bartlett Reserve in Richmond, against the Richmond Centrals Football Club.